Developer	 Ativa Hospitality Corp., Ltd.
Main Contractor Ritta Co. Ltd. 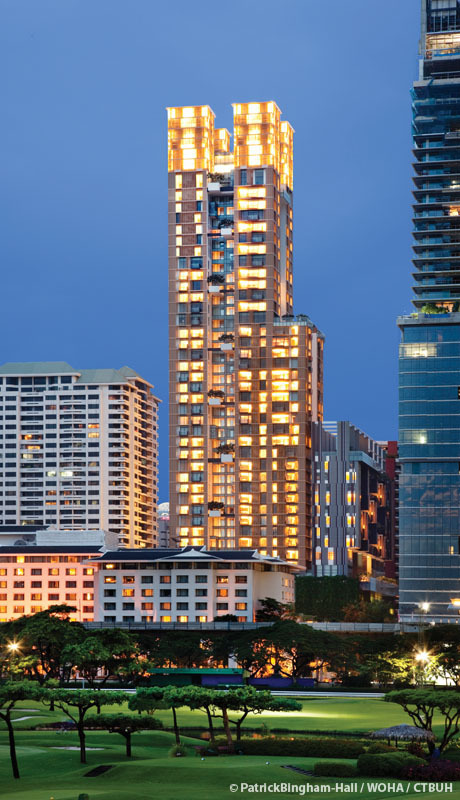 The Hansar is located in the heart of Bangkok, surrounded by luxury hotels, shopping areas, and a large city park. The site is small and irregular, with a building plot ratio of 1:10. 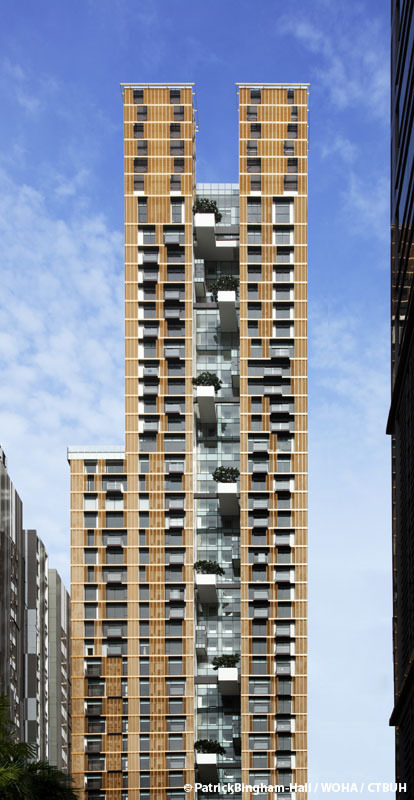 The design captures the value of the site by maximizing the building area. 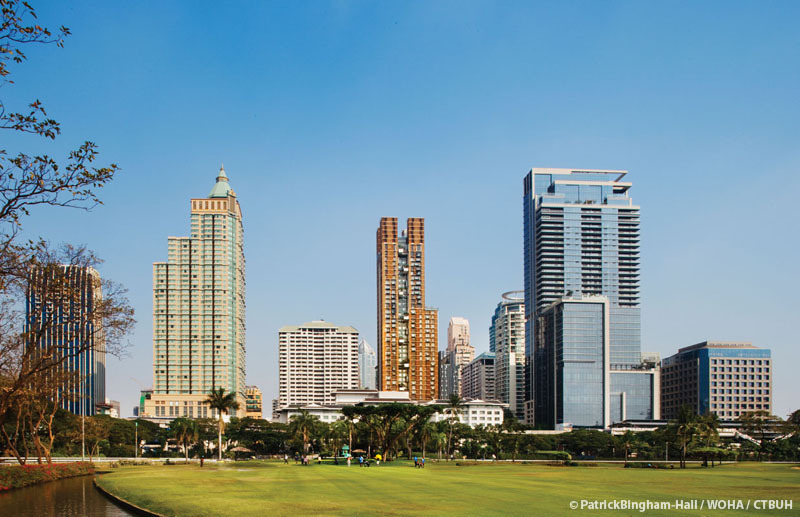 In Bangkok, living up high provides less noise, less dust, cooler breezes and privacy with full exposure to views. The small site limited the potential green areas on the ground level so sky gardens were introduced at height and are equal to 30% of the site area. 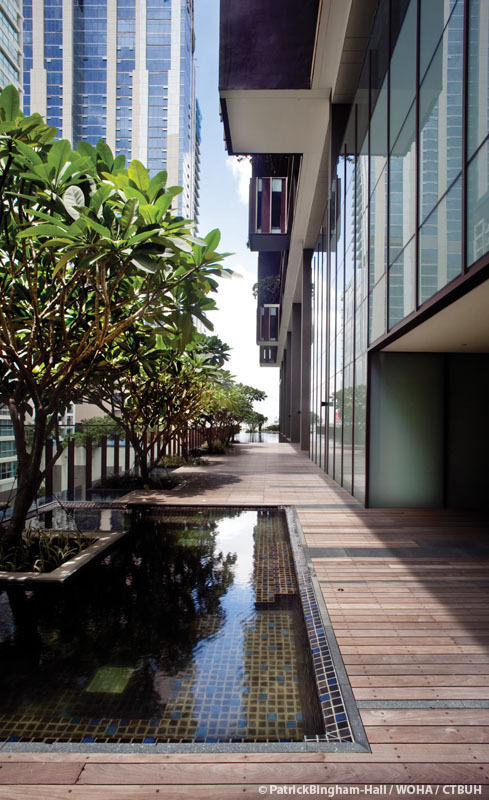 These sky gardens are placed at every fifth floor, and are staggered across both the east and west elevations. 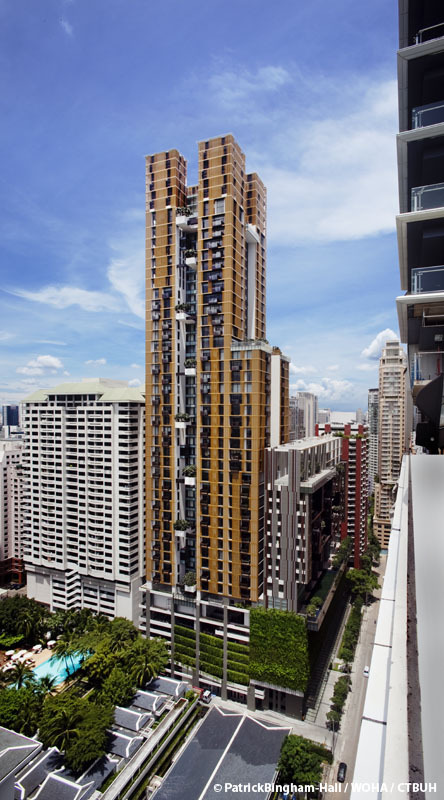 Each unit has either a private lift lobby with an entry to the sky garden or a living room with sky garden views. To negotiate between the desire for views and the need to provide shading, a metal mesh screen was utilized. These sun screens also serve as privacy screens for the units. 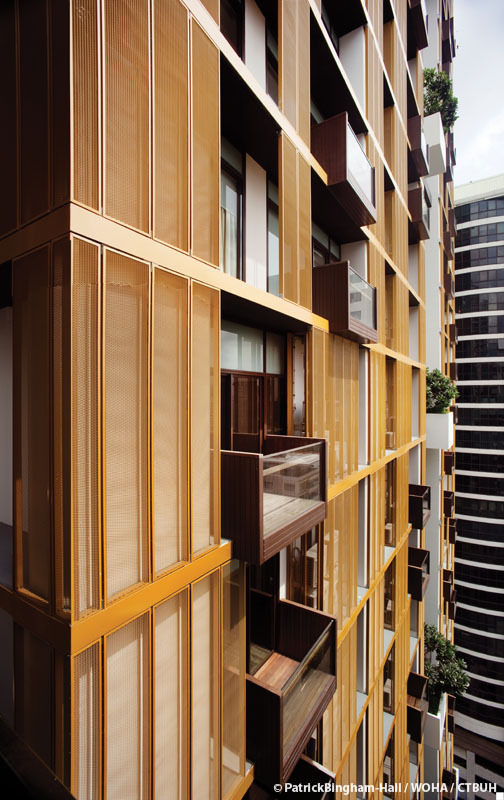 The expanded mesh, which forms the building’s outer skin, is coated in a metallic bronze color to create a contrast to the usually grey Bangkok sky. 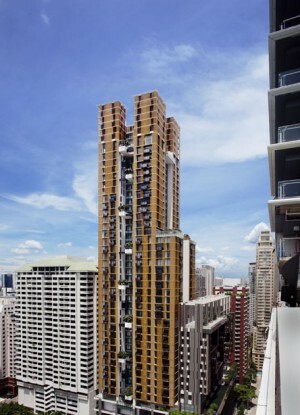 The bronze screen, when combined with the sky gardens, gives a unique character to the development. 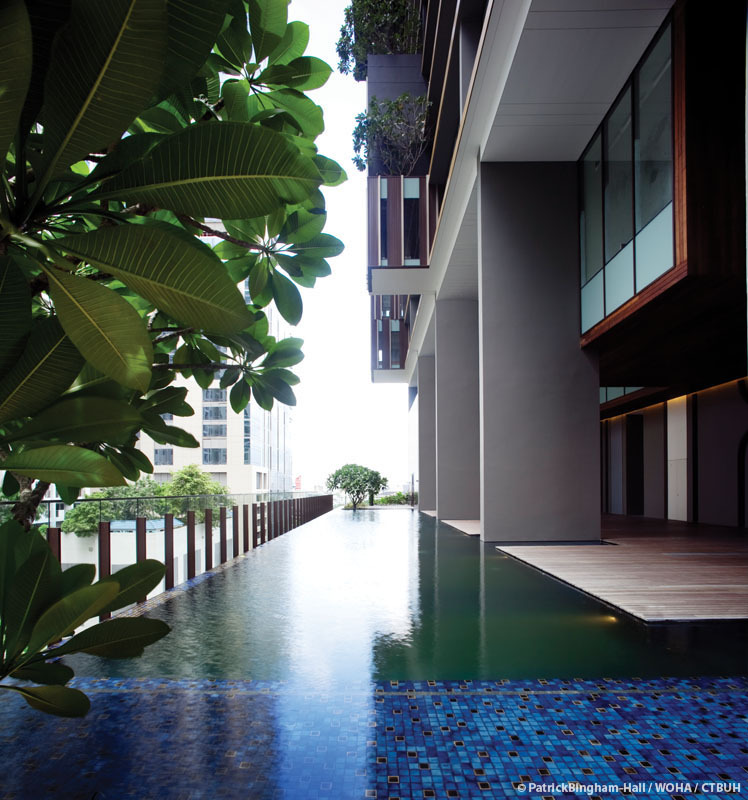 The golden mesh and floating greenery allude to the glimpses of gilded temple and luxuriant gardens that hide amongst the concrete jungle of Bangkok. 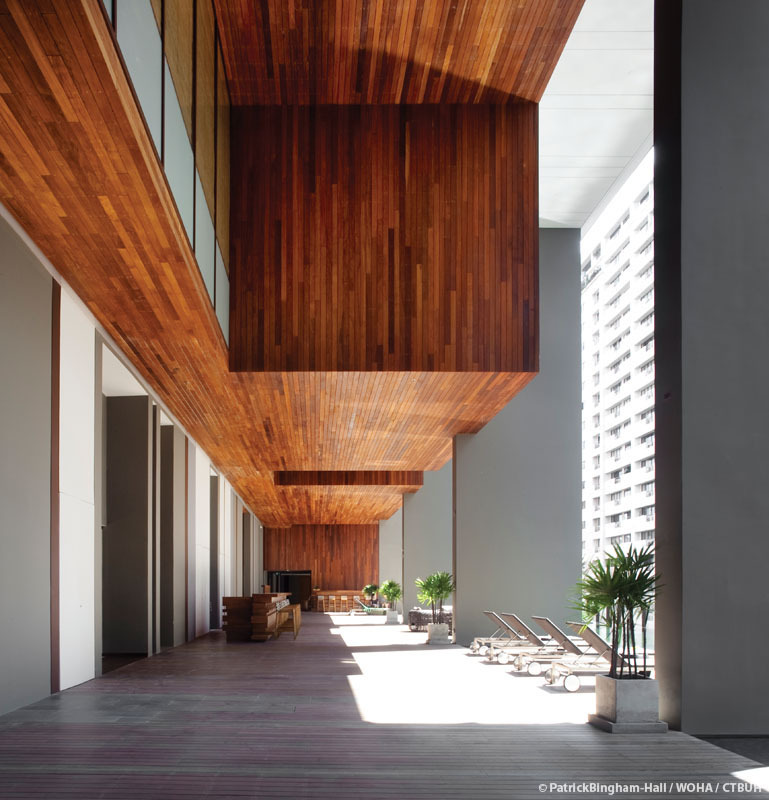 Tropical living is all about the interaction between the interior and exterior, but in a dense urban site this is challenging. 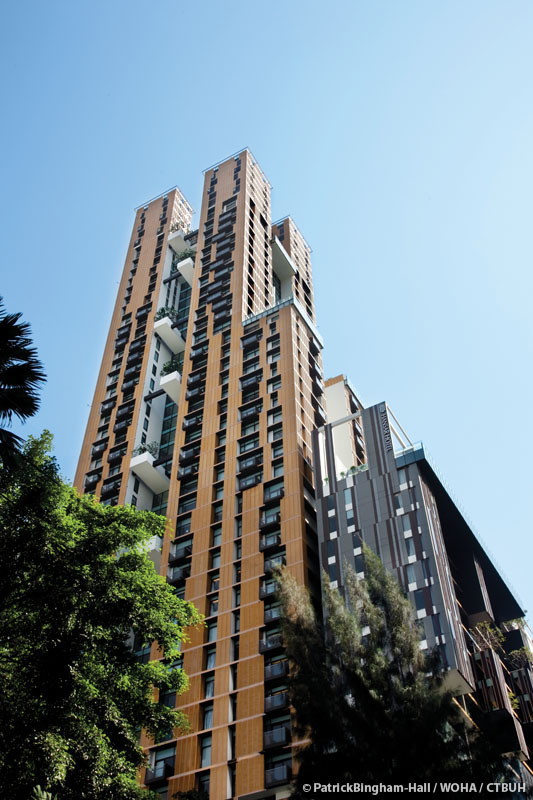 The design looked at ways of creating this tropical lifestyle in a high-density, high-rise development. Landscaping is incorporated in all the common areas throughout the building. Lower level units have private cantilevered gardens. 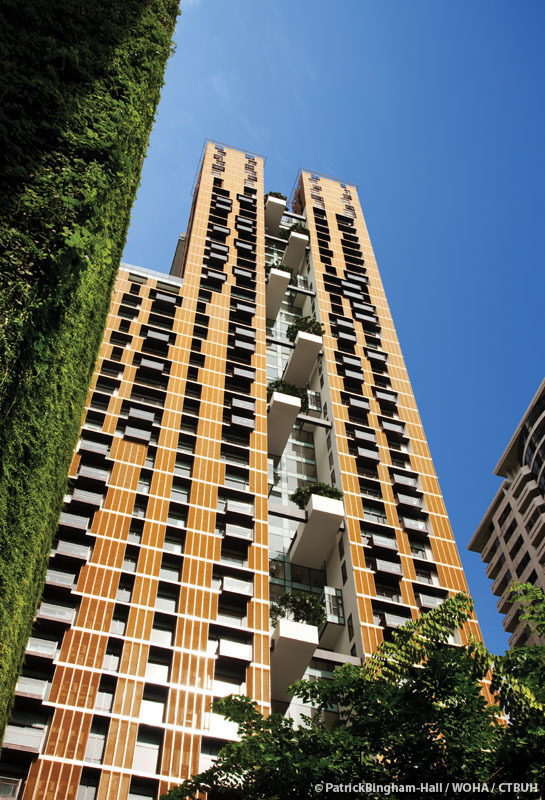 These gardens create a rhythm of green elements which run vertically throughout the whole development. 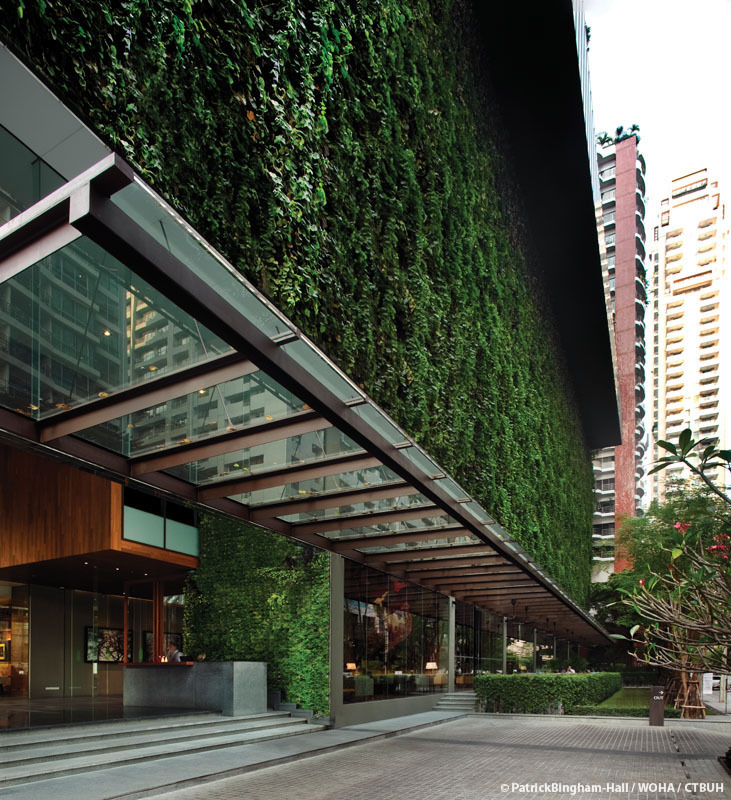 Sky gardens, sky pavilions and green walls have been created all the way up the building to increase the landscape area and interaction between interior and exterior. 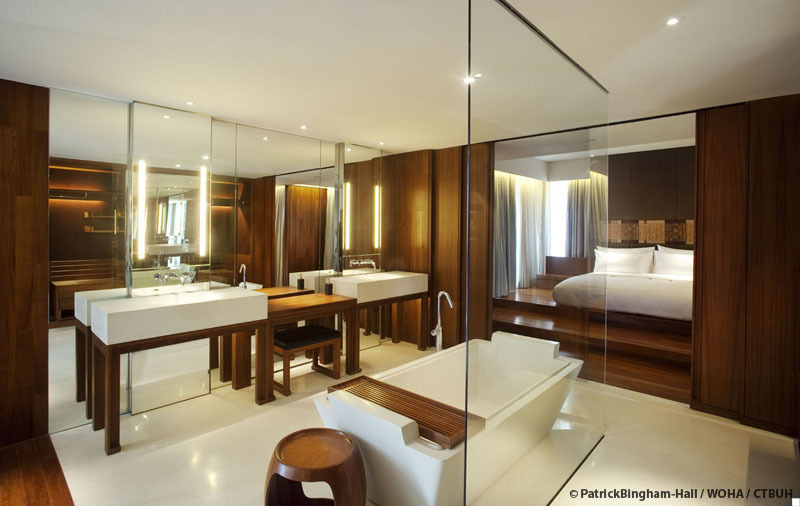 At the hotel, cantilevered sky pavilions project from the rooms. 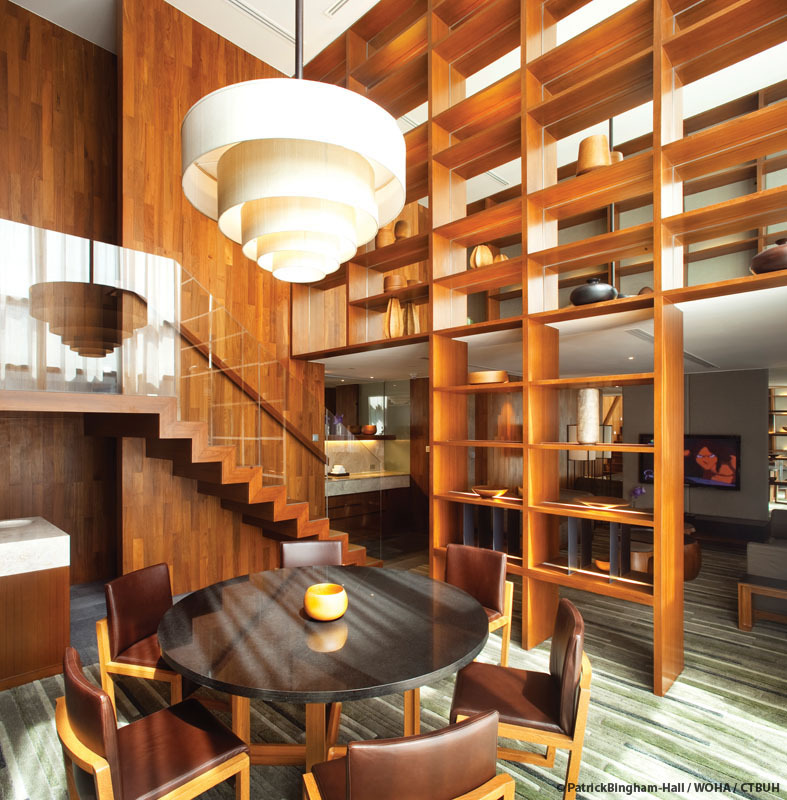 These are topped with sky gardens, which can be enjoyed by the nearby rooms. 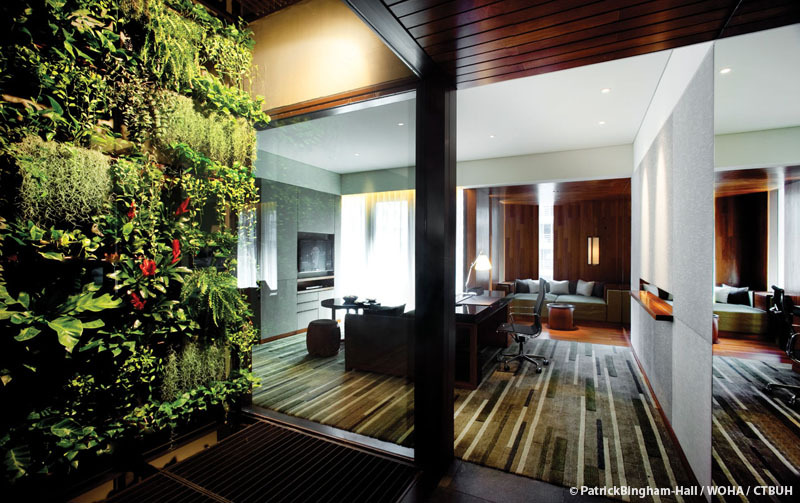 Internal light wells are planted with green walls, and give private garden views to every hotel room. 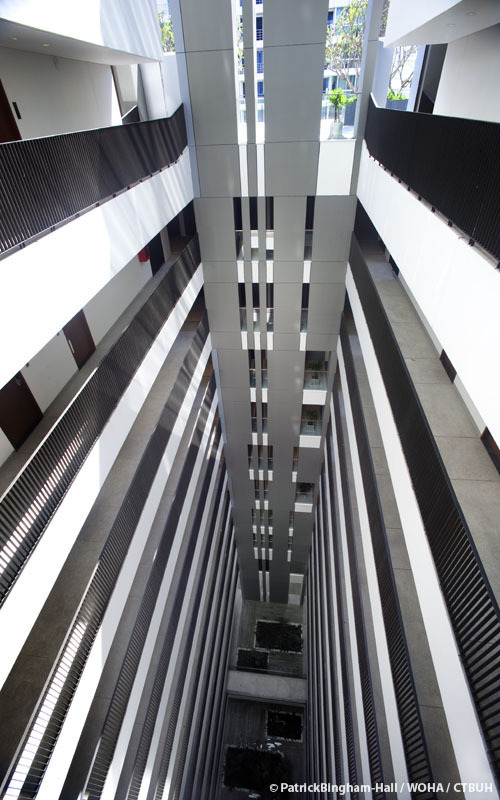 The condominium apartments and hotel rooms are all accessed off naturally ventilated and naturally lit corridors, reducing the energy use of the building substantially. 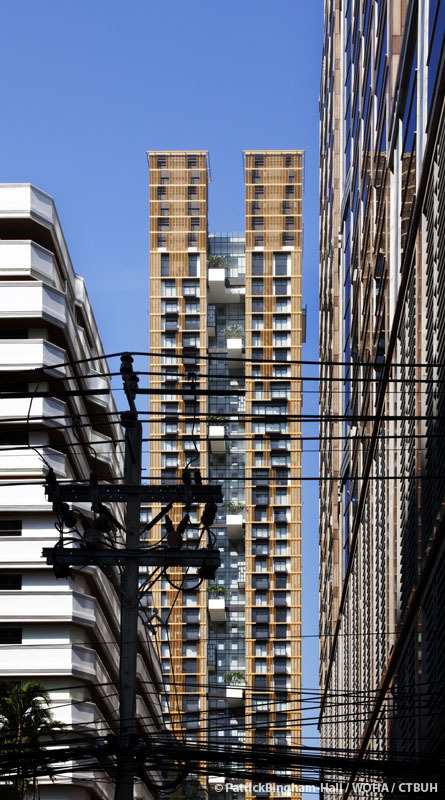 At the podium the ground level consists of retail below six stories of above-ground parking (due to frequent flooding, underground parking is not a good option in Bangkok). 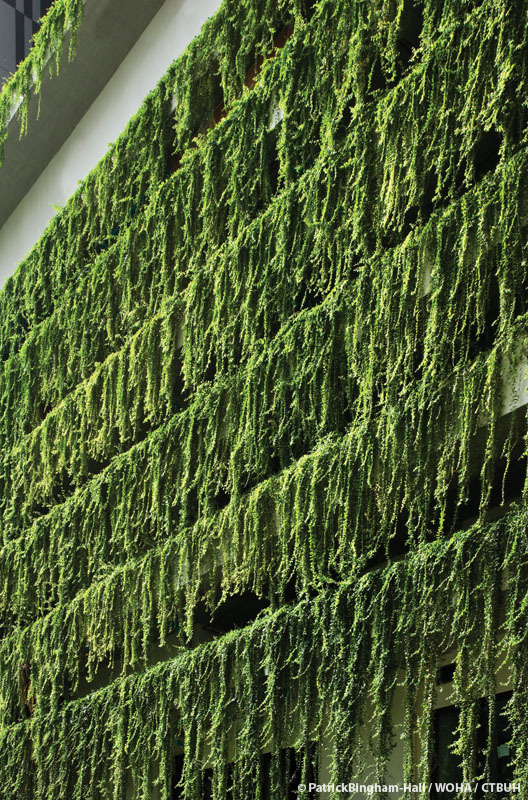 Green creeper screens wrap around the car park podium, on top of which sits the cantilevered swimming pool.